Hilgay Ten Mile Bank smockmill stood beside the road to the west of the river Ouse and Hilgay toll bridge, some distance to the southwest of Hilgay. The mill used two pairs of patent sails to drive a single pair of stones. A Burrell 7 horsepower portable steam engine was powering a further pair of stones in an adjacent separate building on the premises by 1892.
of Mr. G. Leflay who is leaving the neighbourhood. 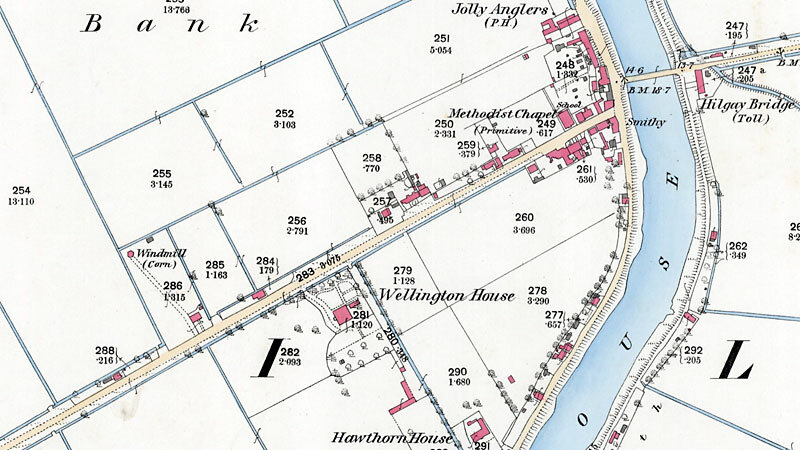 well stocked Garden & Pasture Land, situate at Ten Mile Bank in the parish of Hilgay, Hilgay containing in all 1 acre 2 roods (more or less) abutting north upon Church lands, east upon property of Mr. S. Cossey, south upon Station Road & west upon property of Mr. J. Goodchild. The Wind Mill is strong & substantially built in brickwork, with 4 patent sails, 1 pair of stones & dresser complete. The steam mill, with engine & coal house is nearly new & quite separate from the wind mill, contains pair of stones & dresser complete with 7 horse power portable engine by Burrell, all in good working order. The other buildings upon the property consist of granary, stable, cowshed, chaff & root houses, cart shed & piggeries, the whole conveniently arranged & forming compact premises. An extensive business has been carried on by teh present tenant & ther eis a splendid opening for still further increasing the business. Further particulars may be obtained of the Auictioneer, Railway Road, Downham Market or of Messrs. Reed & Wayman, Solicitors, Downham Market. To Let, with immediate possession the Wind & Steam Mills, with granary, stables, cow sheds, piggeries & cart sheds; together with convenient Dwelling House with garden & pasture land, late in the occupation of Mr. George Leflay. Auctioneer & Estate Agent, Downham Market. Lincoln Rutford & Stamford Mercury - Friday 3rd March 1899. On 26th May 1972, Frederick Edward Whittome of Kings Lynn (ex Hilgay) wrote to Harry Apling and related that Leflay's mill was a small smock mill.